I dig this! 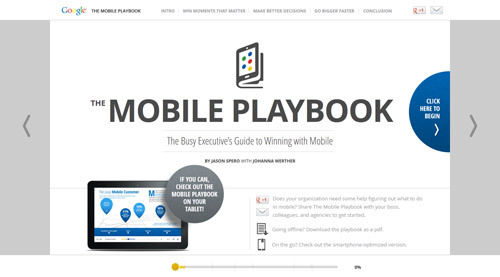 Google released an inspirational, mobile marketing and statistics insight “site” the other day – called The Mobile Playbook. Even though the statistics are mainly generated from the US, it’s a relevant and inspirational read for anyone gearing up for mobile devices and want to know more about how, when and where we use them – to be able to tap in to the potential of mobile.